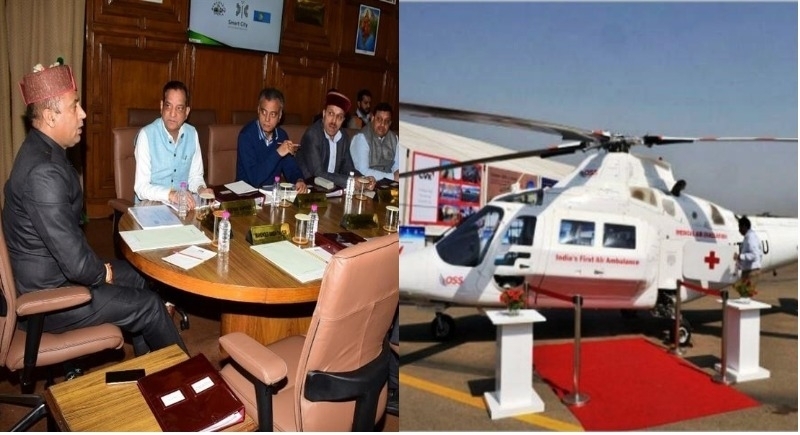 Shimla, April 27: In a bid to strengthen the health transport services and timely airlifting of the patients particularly of remote and tribal regions of the State, the Himachal Pradesh government on Thursday decided to introduce free Heli-ambulance services. Notably, the Himachal Pradesh Cabinet meeting headed by Chief Minister Jai Ram Thakur while taking into consideration the tough topographical conditions of the state decided to introduce free Heli-ambulance services to be operated by Heli-mission Switzerland with the assistance of Lady Willingdon Hospital, Manali in District Kullu. Approval was given to set up health care transformation project viz: TATA Digital Nerves Centre Platform (DiNC) in Kullu district. DiNC is a service led platform model and facilitate to and fro communication between patients, hospitals and doctors irrespective of their geographical locations. It helps to screen basic symptoms, facilitates doctor consultations and to send alerts for follow-up and manages records of the patients. On this occasion, the cabinet gave its nod to fill up 1235 posts of Transport Multi-Purpose Assistants (TMPA) in Himachal Road Transport Corporation. It also accorded its approval to fill up 200 posts of Clerks in H.P. Secretariat Administration Department (SAD) on contract basis through direct recruitment and 25 posts of Junior Scale Stenographer in H.P. Secretariat Administration Department (SAD) on contract basis. It decided to fill up 100 posts of Junior Engineer (Civil) and 20 posts of Junior Engineer (Mechanical) in Public Works Department on a contract basis. The Cabinet decided to fill up 25 posts of Assistant Engineer (Civil) and two posts of Assistant Engineer (Electrical) in Public Works Department on a contract basis. It gave its nod to fill up two posts of consultant and two posts of data entry operator under State Medicinal Plants Board in Ayurveda Department. The cabinet approved to upgrade Civil Hospital Nurpur in Kangra district to 200 bedded hospital along-with creation of additional 42 posts of different categories. It was decided to fill up 7 posts of different categories for the establishment of Programme Management Unit in Ayurveda Department sponsored by Ayush Ministry, Government of India. The Cabinet accorded its approval to open new State of Art Industrial Training Institute at Chhatari in Tehsil Thunag of district Mandi besides creation of requisite posts of different categories to man the institute. It decided that the Gram Panchayat Veterinary Assistants (GPVA) who have completed as five years of service will be brought under contract. The Cabinet gave its approval to purchase 26 new ambulances under National Ambulance Service-108 as a replacement to facilitate the patients.